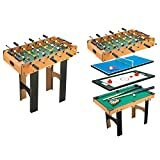 When you cannot decide on a single games table and you happen to be on a budget that does not allow you to go for more than one games tables and you also lack space then you could go for multi games tables that are available in different sizes. 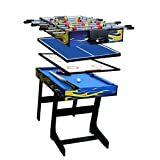 They would allow you to play table tennis, pool, snooker, air hockey and a range of other games by simply replacing your table top in accordance with what you may want to play. So, a multi games table would allow you to play multiple games and you could pick which games subject to the fact that a table exists that could cater to your needs. Here is a list of the most popular multi games tables for your reference. Several categories of multi games tables exist from many different brands as the number of combinations possible leaves you virtually spoilt for choice. Here is a list of te top 10 best that you could pick from and be sure to not go wrong at all with your choice. remember, go only for those games tables that you need by picking those games that you would actually enjoy playing. 5 in 1:football,pool table,table tennis£¬basketball shot and hockey. Unique quick & easy game change. 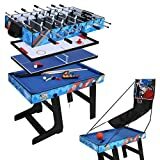 Revolutionary 3 in 1 multi game table. 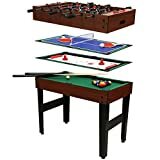 Play foosball, pool or air hockey and swap in seconds. A versatile addition to any games room. Includes free accessories for all three games - play right away! Supplied with free accessories for all three games. 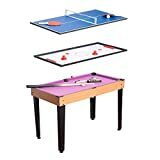 Compact designed table which converts easily to play 3 different gamesؓnooker Pool, Hockey and Table Tennis. Constructed from MDF with a polished playing surface, wood effect frame and plastic markers at either end. High gloss playing surface for a professional ice hockey game.